Following a series of racist incidents in our city over the last few months, Stand up to Racism Edinburgh is organising a “Leith Stands Up To Racism” march and rally on October 27 to say refugees and migrants are welcome here and no to racist attacks in our multicultural community. The march and rally will be followed by a music event in Leith Dockers Club. Seafield WwTW site operators, Veolia, will be undertaking their annual planned inspection and maintenance works of the Thermal Hydrolysis Plant (THP) which forms part of the sludge treatment area. This will involve the partial shutdown the THP to permit the required inspection and statutory certification to take place. As has been the case on previous occasions this activity has been discussed with Regulators and an odour risk assessment has been undertaken, setting out the relevant tasks and mitigations for the activity. but based on the manner in which this work has been managed previously and the forecast weather conditions (see below) the risk of elevated odour emissions and subsequent impact is ranked as low. Work will commence on Saturday 29th September 2018 and whilst Veolia shall endeavour tocomplete this work as soon as possible it is estimated that the work will take until Thursday 4thOctober 2018 before the plant will be returned to normal operation. We shall inform stakeholders when this activity has been completed. Leith Festival are still looking to recruit 10-15 volunteers to help out at this years festival. Do you enjoy meeting new people? Want to support your local community? Agree that Leith Festival is a great event? 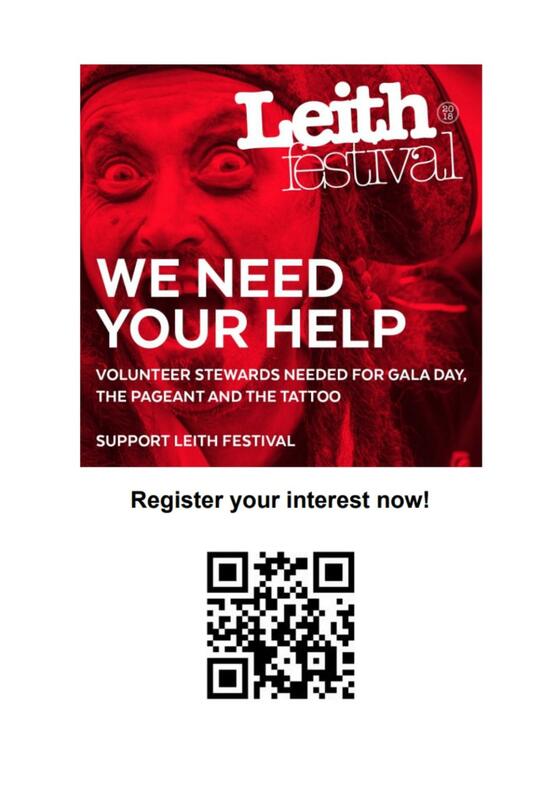 Leith Festival are currently recruiting volunteers for this year’s Festival. We primarily need Stewards to help set up on Galaday morning, for the Pageant (dressing up optional! ), and to help with clean-up on Galaday evening. If you are interested in supporting this fantastic community event, register to volunteer using the online form at the QR code or the link above. We look forward to welcoming you to the Leith Festival Team! !